A blog devoted to the psudohistory of Aeronef and the hordes of ships I have built and collected. I don't post many battle reports but for the centennial of the battle of Coronel I knew I had to do a little something. So I created a mini campaign around the battle altering standard rules just a little. To keep things even both squads stars with 2 armored and one light cruiser. Support was dependent on a separate skirmish I called "race for the relay" a short ship on ship scenario that only lasts 8 turns. The premise was which ever side can reach and hold the relay for three turns gets to call for aid. Since the Germans won their 2 light cruisers on patrol in the area rush to the aid of the main force. had the British won, the battleship Canopus would have arrived to assist their force. The first skirmish "race for the relay" took place yesterday and will give their side a definitive advantage. Since the real world British force was made largely of reservists I had a novice Aeronef player command their force. Now to get to the battle! Both sides face off starting with even forces the German reinforcements arrive 3rd turn. Not too much happens in the first few turns as the fleets close in and Glasgow opens fire on the Germans with little effect. 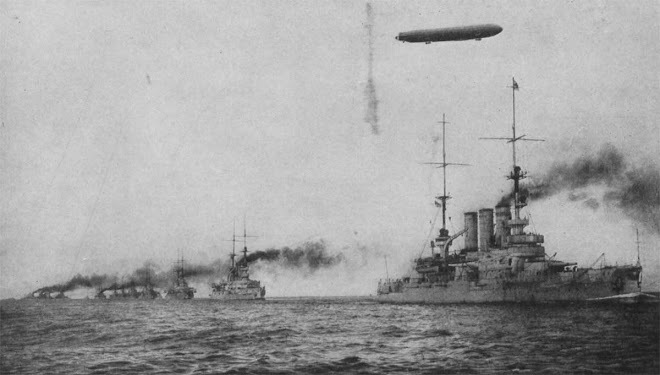 Nurnberg and Leipzig arrive and race to aid their sister ship Armored cruisers from both sides exchange light fire with little effect, but the British seem to be preparing for a broadside. Glasgow goes down. Had the player been more experienced he may have allowed Glasgow to flee for a victory point, but instead fought on dealing some damage to all three of the German light cruisers. Armored cruisers exchange broadsides dishing out damage. Goodhope goes down nearly taking Genisenau with it! Mammoth Strikes her colors and is promptly boarded and captured! One of the rule mods I made was for ships who don't pass morale tests to immediately "strike their colors" and stop doing much of anything. The battle was a resounding victory for the German Empire who earned every possible victory point and capturing a British cruiser in only 12 turns. The results were almost too good to be true, very much like the real world battle. This scenario was great and not as one sided as it may look, I will do it again soon, but might change up a few of the rules to give the Brits a more victory points like limiting the turn number or providing them an additional ship like Otranto. Perhaps in another year or two I will have it all hammered out. I am a man of few words who enjoys miniature games history and anime just dont tell my Shipmates.